The title of this article can be taken in two different ways, and I mean both of them. On the one hand, “Doubt Away” might sound protective, as in put doubt away. Or it might seem permissive, as in go ahead, doubt away. As Christian educators we should teach and model to our students how to do both. When it comes to doubt, we aim for protection while giving large swaths of permission. We aim for protection because the goal of the Christian life is faith, not doubt. We’re called believers, not doubters or even wishers. 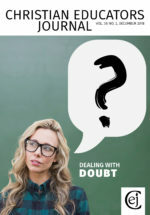 But we give our students—and we give ourselves—much permission to doubt because we understand that while doubt is not the goal, neither is it the opposite of faith. This article will examine both permission and protection, and each section will close with specific tips for keeping our faith. We live in a secular age that threatens to turn us all into doubting Thomases. I once saw a jogger run past a splintering pole. I winced and wondered what it would feel like to brush against its shredding shards. I remembered Jesus was nailed to a cross like that. And then I thought, What if he wasn’t? How do I know the story in the gospels is true? I shook my head and snapped out of it. How did seeing a jogger lead me to question my faith—and in three short moves? It’s the times we live in. We are continually told we only know what we can empirically prove, so it’s natural to start to wonder about the facts of history. Especially when they’re important. The higher the stakes, the more we’re likely to doubt. Remember the shadows of doubt you felt when you closed on your house? I’m borrowing how much money, for how long? Or perhaps also on your wedding day? Do I really know this person I’m going to live with for the rest of my life? Big ticket items like a mortgage or a marriage make us want to know for sure. It’s the same with God. Nothing is more important than knowing the one true God. The stakes could not be higher. Everything is at risk. If that doesn’t cause an occasional lump to rise in our throats, we’re probably not thinking. But as with mortgages and marriage, the doubts that arise provide an opportunity for discovery, which either leads to change or confirmation. When we pursue answers to our doubts, we should eventually find either that we were wrong (so we change our beliefs) or that we were right (so we confirm our beliefs). Either conclusion is an improvement. So rather than run from doubt or pretend we’re not doubting, we should use our doubts as an opportunity to find and verify the truth. Of course, the process of discovery can be excruciatingly painful. Sometimes we wonder if we will ever know for sure. We may become paralyzed by fear, not knowing what to think or do. When this happens, the following are three truths that may help through our dark night of the soul. Michael Wittmer is professor of systematic theology at Grand Rapids Theological Seminary and author of Despite Doubt: Embracing a Confident Faith (Discovery House).